The controversial 1893 French Military Franchise essays of the New Hebrides were a ploy by the French to have military force sanctioned to protect their settlers. These essays were rejected by the British, who did not condone military force under the Joint Naval Convention which was active at the time. An unknown but small quantity of these essays have survived. The order of the printings has been one of the conundrums facing those collectors attracted to the exotic nature of the essays. 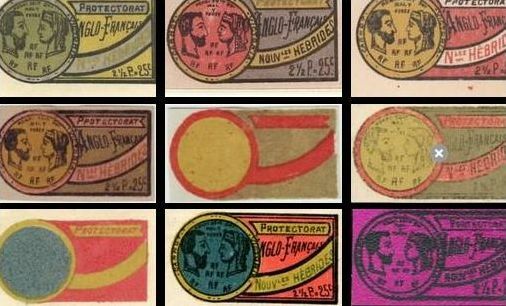 These essays may once have been regarded as of little importance in the grand scheme of New Hebrides philately. However, they play their part in the political shenanigans that went on between the British and the French before the Condominium came into being in 1906. As such, any showing of traditional New Hebrides should incorporate these essays where possible. This website was created as a communal research site for collectors to learn more about these essays. 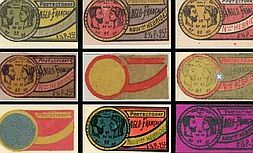 It aims to put on line scans of all essays encountered since 1998 when collectors first began online collaboration on the stamps and postal history of the New Hebrides. Scans of essays provided are from the Aore, Blinco, DEG, (Fletcher), (Goron), (Jersey), Klinger, Mele, (Merot), Millet, (RMD), Ruecker, Petit, (Santo), SeSi and Treadwell collections. Also featured are essay scans from auction houses, dealers' stocks and eBay. Contribute essay scans and comments to the website via .